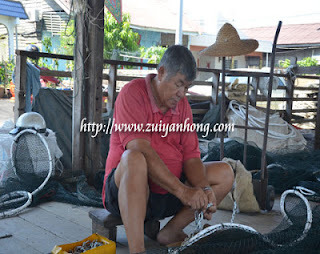 Visiting Selangor Sekinchan Bagan Fishing Village is pretty interesting. Beyond savoring fresh and delicious seafood, you can widen your vision on fishing village. Looking at photograph, perhaps you might think that the man was repairing fishing net. Actually it's not. Based on the information disclosed by the boss in the photo, he was processing the new fishing net. 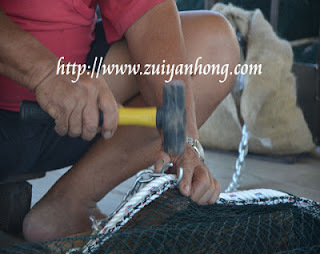 Before utilizing the fishing net, it has to fix with coarse rope. The boss was truly capable in doing this job, or else he would hurt himself. After bundling the rope, have to install plastic ball at fixed distance at the rope. As far as I know, the name of this fishing net is trawl net. It's also named as tiger net. 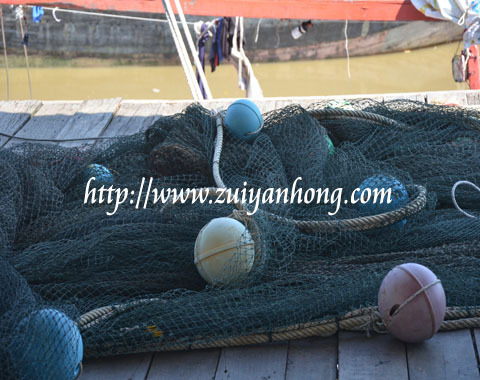 The plastic balls are used for making the upper part of the fishing net to float. 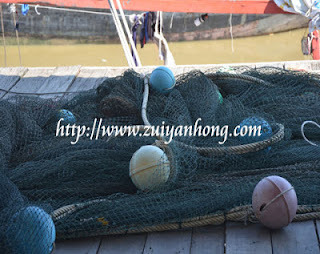 The bottom part of the fishing net is added with heavy objects so that it will sink. Chatting with the boss, I am aware of many stories about Sekinchan fishermen. He is used to do that because it's his routine work.